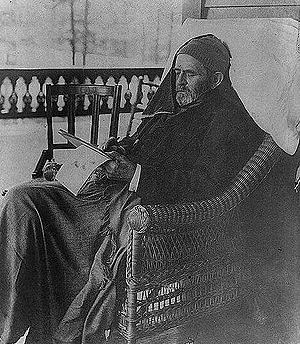 The 1st photograph shows American Civil War general and 18th president Ulysses S. Grant (1822-1885) in the prime of life and the 2nd photograph shows him at the end of his life, penning his memoirs. He had withdrawn to a cottage in Saratoga County, New York, after learning he had throat cancer, and died just days after finishing his well-received autobiography. Here is what happened to his body.... Grant died, medicated against the pain and emaciated by the illness, on a July morning. The sad news began spreading by telegraph within minutes, after which expressions of sympathy began pouring in - including one from President Grover Cleveland - and dense crowds formed around the cottage. The mayor of New York wired an offer of a site in any of the city's parks for a tomb. The doctors in attendance asked his family twice about performing an autopsy, but they refused on both occasions. Sculptor Karl Gerhardt was on hand 20 minutes after Grant's demise to make a death mask. Local undertaker Ebenezer Holmes was summoned and arrived within hours to prepare the body until clergyman and undertaker Rev. Stephen J. Merritt could arrive from New York City. Holmes placed Grant's remains on ice in the corpse cooler that he had patented in 1878. Grant had left explicit instructions before his death that his body should be embalmed, so that it would not decompose in the summer heat before the funeral could be arranged. Holmes therefore carried out the relatively new procedure of arterial embalming over the next two days. The body - said to look very natural by some of the estimated 300 people who viewed it - remained at the cottage, guarded by the military, for 2 weeks, when a local funeral service was held. A polished red cedar coffin had arrived from Rochester on July 29th and in it the remains were transported by train to Albany, where Grant lay in state in the state capitol for 3 days and 2 nights. By then, conflicting accounts described the body as discolored, deteriorating, and somewhat disheveled from the journey. The press criticized Holmes' work, and there Grant was touched up by Merritt. 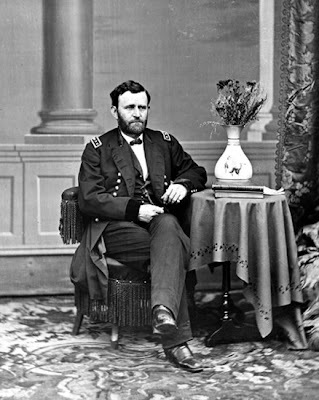 Grant was taken by train to New York City, where he was viewed by some 250,000 people as he lay in state in City Hall. More than a million people attended and 50,000 participated in the day-long funeral parade in New York City on August 8, 1885. A public burial service was held, and Grant's body was deposited in a temporary vault in Manhattan's Riverside Park until it could be transferred to Grant's tomb, which was completed and officially dedicated in 1897.